Assam Agricultural University Recruitment 2018 | Research Assistant/ Field Worker/ Multi Tasking Staff posts : Hello Everyone. AAU Jorhat latest recruitment notification is out for the month of July 2018. 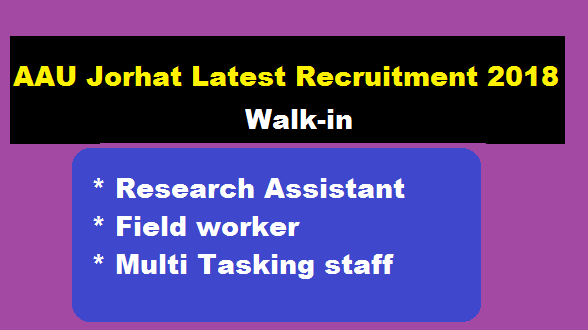 According to the latest Assam Agricultural University Recruitment 2018, A walk-in-interview is scheduled for filling up the post of Research Assistant/ Field worker/ Multi Tasking staff for a period of 15 months subject to satisfactory performance of the service under the ICMR Task Force Project to be implemented in the Department of Food Science and Nutrition, Assam Agricultural University, (AAU )Jorhat. In this section, we will discuss in detail about Recruitment of Research Assistant/ Field worker/ Multi Tasking staff positions under AAU Jorhat Recruitment 2018 with all the details and requirements. Educational Qualification: Candidates must be Graduate in Science/relevant subject from recognized university with 2-3 years experience, or, M.Sc. in relevant subject. Educational Qualification: High School or equivalent. Name of the Project: Consumption pattern of food and food products/ items high in fat, salt and sugar among selected cities/ towns and rural population of India. Eligible candidates having requisite qualification may report at the office of the Principal Scientist & PI of the project, Department of Food Science & Nutrition, College of Community Science, Assam Agricultural University, Jorhat and submit applications in plain papers enclosing proper bio-data, with experience if any, attested copies of certificates and also their original certificates, testimonials, as per date, time and venue mentioned below. The advertisement may be seen in AAU Jorhat website www.aau.ac.in. Note: No TA & DA will be admissible for attending the interview. Full advertisement for AAU Jorhat Recruitment 2018 can be found here.